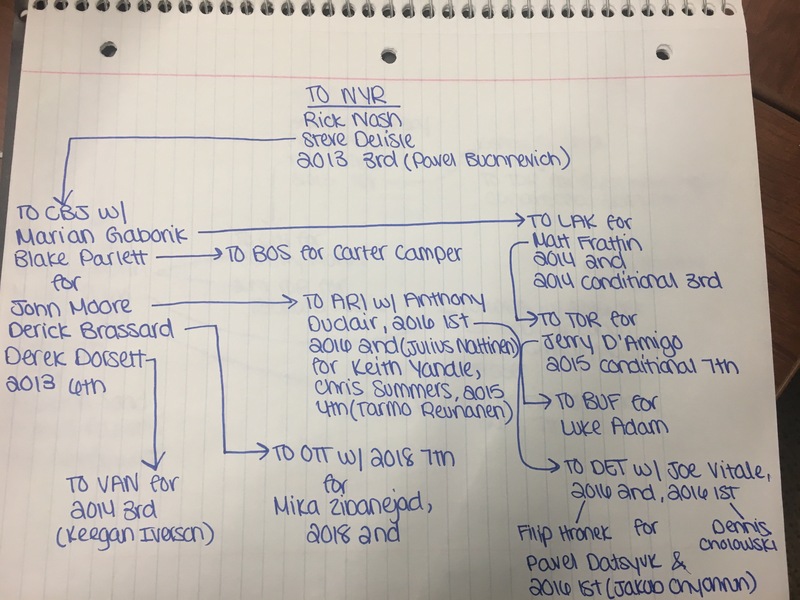 Trade Tree : The Rick Nash Trade & Who Won The Trade? After being selected 1st overall by the Columbus Blue Jackets, Rick Nash went on to set almost every record possible for the franchise. He’s CBJ’s all-time goals leader (289), all-time points leader (547), most goals in a season (41), and most points in a season (79). Being the captain of the Jackets, Nash was a vital reason they were even a team for most of the years he was on the team. In 2012, the front office of CBJ decided that it would be best for them to trade Nash so they could better their team for the future. Nash waived his no-move clause, and the Jackets sought a trade partner to move their top player to. In the end, Nash ended up getting dealt to the Rangers in a blockbuster deal. The Columbus Blue Jackets sent Rick Nash, Steve Delisle, and a 2013 3rd round pick to the New York Rangers in exchange for Brandon Dubinsky, Artem Anisimov, Tim Erixon, and a 2013 1st round pick. It’s a big trade, we all know that. But when you initially look at the deal, you don’t look past the trade. This trade resulted in a multitude of blockbuster deals in the future. 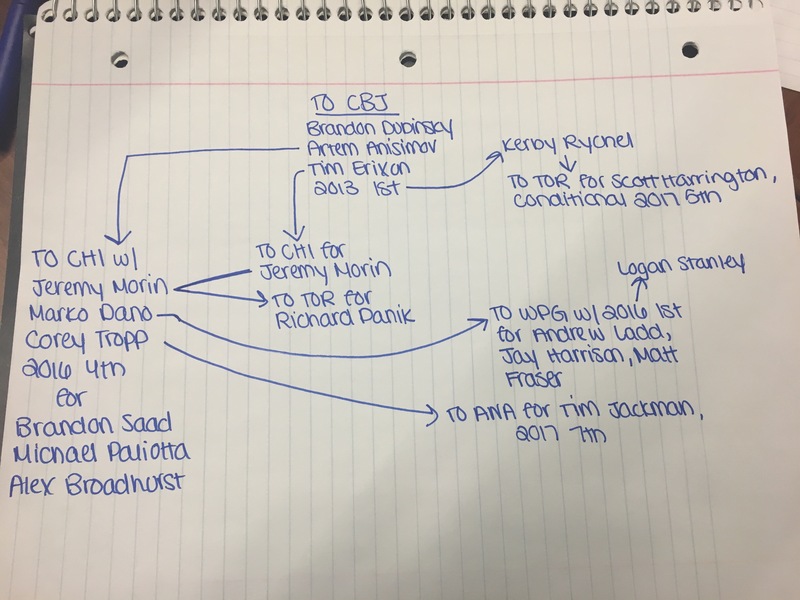 So let’s take a look at the trades in full force, and what resulted in each of them, and who won the deal in the end. Holy smokes! Okay, so that’s kind of a lot of things that happened thanks to Rick Nash, I guess. But instead of breaking down the entire trade piece-by-piece, let’s take a look at the important parts of this deal, instead. Obviously, Rick Nash has been the contributor the Rangers hoped he would be. Since arriving in New York, Nash has scored 118 goals and 92 assists for 210 points in 285 games. That doesn’t seem like a lot, but Nash was hurt for a good part of the 2013-2014 season, as well as the 2015-2016 season. He’s been a quality second-line winger who’s as underrated defensively as anyone in the league could be. He’s been an exceptional penalty killer for the Blueshirts. Now, what did that 2013 3rd round pick become? Well, most of you Rangers fans know. But for those who don’t, New York drafted Russian forward Pavel Buchnevich with that pick. After signing him to an entry-level contract this past summer, Buchnevich has tallied 6 goals and 8 assists for 14 points in 17 games. He’s spent the majority of this season recovering from a back injury, but that’s an impressive total for a rookie in his first year in North America. I can almost guarantee if he wasn’t hurt, Buchnevich’s point total would be far beyond what it is now. The defenseman the Rangers received in the Nash trade, Steve Delisle, wasn’t much for them. In fact, a year after getting to New York, he was traded back to Columbus in the Marian Gaborik trade. I would argue that the Rangers were far and away the winners of that trade. But every single piece that New York received in that trade has been dealt away. John Moore was dealt to Arizona in the Keith Yandle deal at the 2015 trade deadline. Derek Dorsett was traded to Vancouver for a 3rd round pick. Derick Brassard was off to Ottawa this past summer along with a 2018 7th round pick for Mika Zibanejad and a 2018 2nd. Brassard was a wonderful contributor as a 1b center for the Rangers, totalling 69 goals and 105 assists for 174 points in 254 games. But New York needed someone younger and guaranteed to stay for a long time, and Mika Zibanejad was the definite answer to that issue. The piece of this deal that ended up being the biggest in the end, however, was John Moore. At the 2015 trade deadline, John Moore was traded to the Arizona Coyotes along with forward Anthony Duclair, a 2016 1st, and a 2016 2nd in exchange for defenseman Keith Yandle, Chris Summers, and a 2016 4th. Keith Yandle is long gone, signing in Florida in the offseason. Chris Summers is an AHL defenseman. That 2016 4th round pick, Finnish defenseman Tarmo Reunanen, won’t be anything for a while. Winners? I’d say the Coyotes, for sure. Yeah, that’s right. The Rangers basically gave the Coyotes Jakob Chychrun. Well, not really. But as a Rangers fan, it kind of seems like that to me. Moving on to the other team involved in this trade: the Blue Jackets! You know who they got, but what have they turned out to be? Well, Brandon Dubinsky has been a quality addition for them. You can look up the statistics, but he’s exactly what the Jackets needed: an agitator who can score if he wants. The 1st round pick the Jackets received was used to draft Kerby Rychel, who’s now with in the Toronto Maple Leafs deep farm system. Defenseman Tim Erixon is long gone from Columbus. And Artem Anisimov was part of the blockbuster Brandon Saad trade in the summer of 2015. I think the Blue Jackets regret trading away Anisimov, who has been the key center for the Panarin-Anisimov-Kane line on the Blackhawks. He’s on pace for a career-high in goals, assists, and points. But then again…Brandon Saad, am I right? So, who wins this trade? Truthfully, I can’t decide. I think the trade, in the end, developed into too much for both teams to be able to come to a definite conclusion of who the winner is. If you want to decide who won the Rick Nash trade, you guys can vote here!